Shining star of the United Arab Emirates Abu Dhabi has been confirmed as the host of two of the most prestigious events in the tourism calendar. First up, the UAE capital will host the 18th World Route Development Forum later this year, while the World Travel & Tourism Council (WTTC) Global Summit will follow in 2013. Both events follow a string of exciting developments in the emirate as it continues to assert its tourism credentials on the global stage. After a very successful World Routes at Berlin Brandenburg Airport, the event was officially handed over to Abu Dhabi Airports Company in October last year. Speaking at the press conference in Berlin James Bennett, chief executive of Abu Dhabi Airports Company said: “World Routes is the aviation event of the year, as it brings together airlines, airports and tourism authorities, and acts as a platform for airlines and airports to investigate route opportunities, as well as identifying areas for ongoing business development. Abu Dhabi is one of the world’s richest cities and fast becoming one of its top destinations, equally accessible from Europe, Asia and Africa. Among the many attractions Abu Dhabi has to offer are the parks, fountains and beach of the Corniche, the Grand Mosque and the Ferrari World theme park, alongside the F1 circuit on Yas Island. “This will be the pinnacle event of the 2012 Routes calendar including Routes Americas in Nassau, Routes Asia in Chengdu, Routes Europe in Tallinn, Routes CIS in Ekaterinburg and Routes Africa,” said David Stroud, executive vice president Airports, Routes of UBM Aviation. He added: “Abu Dhabi will provide us with a Routes first where we return to a previous host city. The event will take place from September 30th-October 2nd 2012. 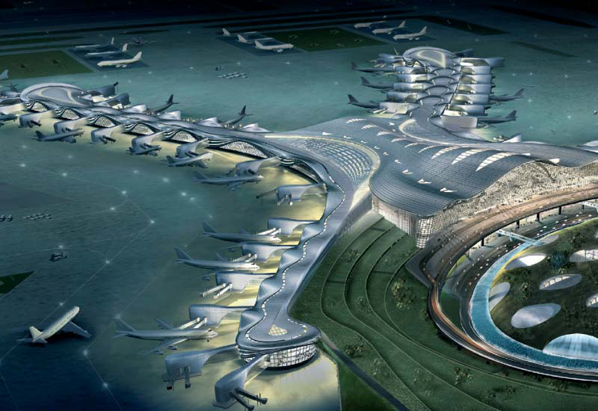 A multi-billion dollar re-development and expansion of Abu Dhabi International Airport is currently underway and is designed to increase the overall capacity of the airport to more than 20 million passengers per year. Routes is expected to grow again and the 18th World Route Development Forum is expected to be the largest ever planned, as more than 3,000 decision-making delegates are estimated to attend the event. Looking toward 2013, the World Travel & Tourism Council (WTTC) has announced it will hold its 13th Global Summit in Abu Dhabi in April/May 2013. The Abu Dhabi Tourism & Culture Authority (ADTCA) and Etihad Airways will be official hosts of the WTTC event, the biggest annual gathering of travel and tourism leaders. WTTC’s decision was based on Abu Dhabi’s compelling presentation, the enthusiasm of government and industry agencies, accessibility of the destination, a high standard of capability and evidence of green tourism growth as a key development strategy. David Scowsill, president and chief executive of WTTC, said: “Our Global Summit is the most influential travel and tourism event of the year, bringing together almost 1,000 industry leaders, to tackle some of the most pressing issues facing the industry today. “I am very pleased that Abu Dhabi will host our 2013 Global Summit. News of the award was enthusiastically received by ADTCA. Its director general, HE Mubarak Al Muhairi thanked WTTC for its confidence in the destination and pledged to fully support the summit. James Hogan, Etihad Airways’ chief executive, said: “We are delighted Abu Dhabi has been chosen to host the World Travel & Tourism Council’s Global Summit in 2013. “Abu Dhabi’s global profile as a business and tourism destination rises by the day and the decision to make the emirate the venue for the Summit reflects this. “Etihad Airways will do everything it can to support the Summit and to ensure delegates have the best possible experience. “I can assure WTTC, its members and colleagues that they will receive the warmest of welcomes and highest levels of professional service from this emirate, which is rapidly emerging as a world-class meetings destination. “This is a sterling example of two stakeholders coming together to achieve success. “The joint ADTA-Etihad proposition hinged on providing a unique combination of benefits – the facilities and services of a leading international business centre coupled with the attractions and recreational possibilities of a luxury destination,” continued Hogan. Etihad Airways is considered the World’s Leading Airline by the World Travel Awards. A Memorandum of Understanding between WTTC, ADTA and Etihad has been signed in the UAE capital. For more information on what is on offer in the emirate check out Virtual Abu Dhabi.